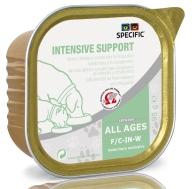 Specific (VetXX) F/C-IN-W Intensive Support is a highly digestible food which helps with the nutritional restoration and convalescence in dogs and cats. It contains high levels of energy, protein, fat and essential nutrients which allows a reduction in required food intake. It is highly palatable and can be easily mixed to provide a liquid-like structure which can be used with syringes. Chicken, pork, fish, eggs, potato starch, fish oil, potato protein, sunflower oil, minerals, psyllium husk, taurine, rice, vitamins and trace elements, yeast (source of ß-1,3/1,6-glucans), L-carnitine. It contains no artificial antioxidants, colours or flavourings. The daily individual requirement may vary depending on the clinical condition of the dog or cat and other factors such a breed, environment, season, activity etc. It is recommended to continue monitoring the clinical condition and the body weight of the dog or cat and to adjust the amount fed accordingly. There are currently no questions for Specific (VetXX) F/C-IN-W Intensive Support Dog & Cat Food - be the first to ask one!